Review: Love. Love. LOVE! How much did I love this book? I stayed up late to finish this-which is something you DON'T DO when you have a five-week old infant. 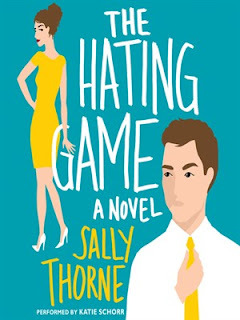 This is the story of Lucy and Joshua, executive assistants to co-CEO's of a publishing company. The book is written from Lucy's perspective and she is simply put-very funny. I chuckled throughout the entire book. Yes, it's predictable but it's so much fun. A fantastic debut for Sally Thorne. If you like chick lit or romance, read this. You won't be disappointed. “Super. Gonna go get coffee. Can I get you some tea?” He has his heavy black mug in his hand. I hate his mug. We march purposefully toward the kitchen with identical footfalls, left, right, left, right, like prosecutors walking toward the camera in the opening credits of Law & Order. It requires me to almost double my stride. Colleagues break off conversations and look at us with speculative expressions. Joshua and I look at each other and bare our teeth. Time to act civil. Like executives.